Brave the cold while looking rugged and handsome in this premium leather jacket. Made from New Zealand lamb leather in black or brown, this jacket features stitched detailing, two front pockets, and classic collar. 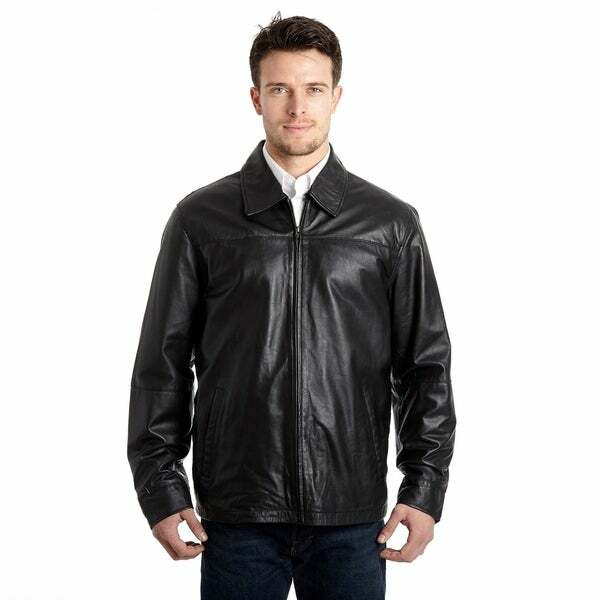 - Men's Lamb Leather Open Bottom Jacket with Self Belted Back- Stunning men's leather jackets and the quality for the money is amazing - the leather is so soft - I wound up buying a second one for my other son - Packing and shipping were good. I was hesitant to purchase any clothing on line without first checking it for quality and fit but I took a chance and purchased the men lamb leather open bottom jacket after reading all the great reviews by your customers. The jacket is very comfortable and the leather is so soft. The quality is just as good as a jacket I bought many years ago that I paid $250.00 for. I would definitely recommend this jacket to anyone looking for a quality jacket at a descent price. I rate it 5 stars. It took quite a few tries to get the jacket that I wanted. Overstock went out of their way to ensure I received exactly what I wanted. They have a great customer service based business and a great staff. This jacket was purchased as a replacement for an older version we bought from Overstock that was burned in a house fire. My husband loved the original one and it looked new for years after wearing it quite often. This one seems to be made equally as well. It looks very classy. After searching in all the local stores, we decided to try Overstock again. Best price and design. Thanks Overstock! This Jacket was way too small for my husband. He normally wears an extra large and that is what we ordered. Most of the reviews I read said that it fits true to size but what we got appeared to be a 'boy's' size extra large. Nice jacket but we couldn't imagine what size to order after the fit of this jacket. It also cost me *** to mail it back and then have to wait on my credit for the returned jacket. Very disappointed and probably won't order clothing from this website ever again. It is so soft!! Very well made too! Sturdy zipper!! I can not wait to give it to my son for Christmas! I had ordered this jacket for my husband's birthday in a 2XL in black. The leather is super soft, the jacket is very well made and truly elegant. This is important since my husband is over 55. I am very impressed and pleasantly surprised with the quality of this jacket, considering how inexpensive it is. I am so happy with my purchase that I just ordered it in brown in an XL for a Christmas present. After years of not wearing coats to school, my son, who now drives to school, decided he needed to wear a coat for the cold walk from the parking lot. One day he just took my black leather coat without asking. His girlfriend likes how he looks in it. I'm ready to get my coat back! So this is the one he is getting for Christmas. It's mostly like mine and is very soft like mine. His gal will like him just as much in it! And Ill be able to be stylish again! My hubby liked the look, but didn't like the length going down to the middle of his hand as he is in his late 60's. He also did not like the smell, as he has another leather coat that doesn't smell like this one that I surprised him with because it was a totally different look from his other leather jacket. I bought this as a present for my son with some trepidation. He absolutely loves it! It fits true to size and the leather is soft and buttery. I would definately recommend this jacket to anyone who wants the feel of a good, soft leather! My fiance loved this. Leather is smooth and soft. Fit perfectly. Impressive selection for my husband. Fits well and great quality. I would recommend to anyone contemplating Overstock site. Overstock.com is far more superior than any other shopping sites. Very satisfied and happy with product. Thank you for the great service. I purchased two of these jackets for Christmas gifts, one in dark brown and one in black. I just received the shipment and was delighted with the quality. The leather is a rich color and quite soft, I am so pleased. I would definitely purchase them again-they were a great price. "Does the 2X size run small? Or is it a good fit?" "does the brown jacket have a patchwork back side and not the black one ?" Inside left there is one regular size pocket. "Are there internal pockets like for phone?" "Is it a lightweight jacket ?" This item is a genuine leather jacket is fairly lightweight but will keep you warm. Wonderfully light & warm. Wore it in Russia & Norway. Great w/layering when very cold. Also perfect for travel! "Does this jacket have a removable liner?" The liner is not removable. No the liner is not removal, but no need to if you want a nice lightweight jacket. "Does the black version have the "self belted back" and not the brown? Asking because in the picture, the brown has a different design on the back, correct?" That is just a slight variation in design both will have the same functionality.